We were in Southern California recently - our family lives in the mountains. Every day, Coyotes come right up to the front of the house. Are they the same species as the ones in Ontario? I took these pictures from the front door. Thanks for your fabulous picture and question, but I am afraid that I don't know the answer - maybe the Coyotes here are the same species as the ones in California, but I am not sure, perhaps one of our readers will know. That is a Western Coyote, different than our local animals. 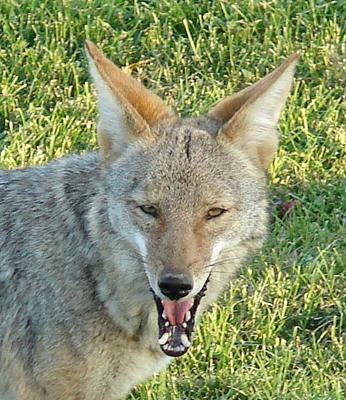 Our coyotes are sometimes called Brush Wolves.